The Cortexa is designed to work with several different types of video cameras (analog and digital (networked) video cameras as well as web cams). If your Cortexa is the "V" model (analog video expansion card), you are able to directly attach up to four (4) analog video cameras to the Cortexa. Another option is to connect a nearly unlimited number of networked web/video cams. An interesting alternative is that you can attach a camera at a Custom URL. Basically this allows you to treat any web camera or image on the Internet as a local camera connected to the Cortexa. This is nice if you want to have the Cortexa monitor a radar or weather satellite image. Select the type of camera you are connecting and then set the corresponding configuration options. The configuration options change depending on the camera type selected. If you happen to be installing a camera that is supported by the Cortexa (like the Panasonic IP Cameras), the Cortexa will allow you to control the camera directly from the Cortexa interface. I happen to have Toshiba IP cameras with pan and tilt capabilities. Unfortunately, the Toshibas are not a supported model on the Cortexa. I am still able to use them. I did this by setting up the "Hardware Type" as "Custom URL". A friend of mine (Hi Dan!) figured out that the Toshibas have an (undocumented) URL where the current still image can be directly accessed. I selected the streaming mode and, although I can't control the tilt and pan from the Cortexa, I get near real-time video. I'm fairly pleased, but hoping that Cortexa may choose to provide support for the Toshibas in the future. Once your cameras are installed and configured, you can click the "Cameras" button from the front page of the interface and live, streaming video from your cameras can be seen. 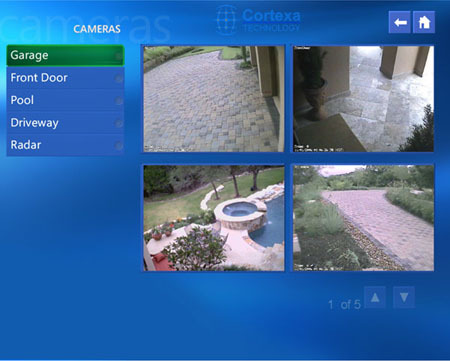 The Cortexa tiles the cameras so you can see four at a time on screen. You may want to use your cameras in conjunction with your security system and other devices. For example, you may wish to program the Cortexa to start recording video when a door is opened or when the driveway gate/sensor is triggered. To do this you will need to set up Events.